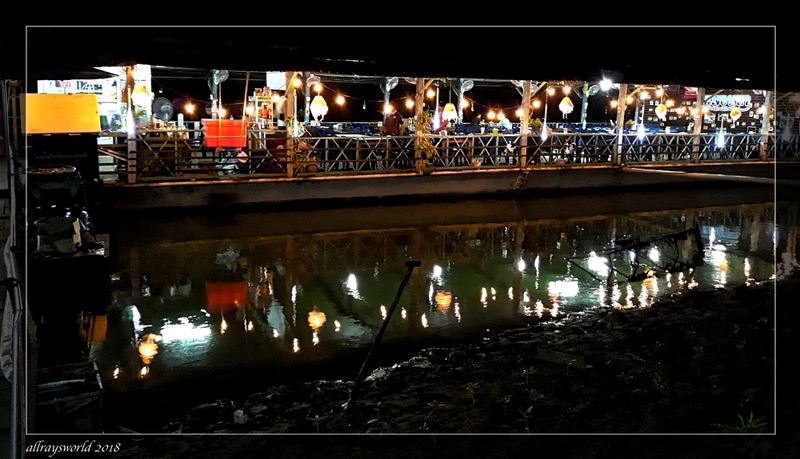 Back in Khong Chiam by late evening, we stroll beside the river to a small pod of hire boats, and book one for a cruise next evening...800baht [about US$25] for 2 hours on the Mekong and Mun rivers at their point of conjunction. Then, noticing...as one does...that the sun has passed below the yard-arm, we immediately break our strolling rythm, find a vacant table on the river-side walk, and sluice the dust out of our throats. 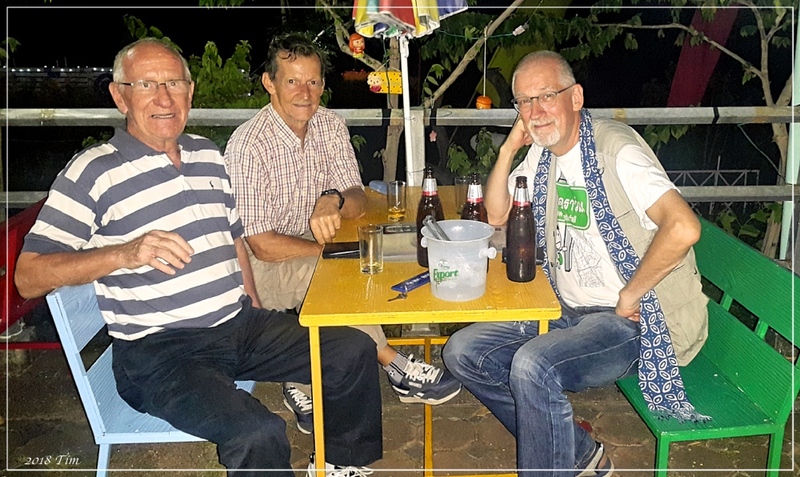 Several beers later, having debated and solved World Hunger and other previously intractable issues, we are ready to eat, so we make our way down to waters edge and board one of the floating restaurants. A pleasant, slow-paced, beer-lubricated dinner is consumed. On the slow walk back to our hotel, we come across a place that rents bicycles, and just happens to have four MTBs available...we book them for two mornings from now. We also see that this interesting place offers breakfast from 0700, so book a meal for three for the following day. Ray: Merci, Martine. J'essaie de transmettre le plaisir de ce genre de voyage. What a fun day! I'm enjoying traveling with you! Ray: As is normal, Elizabeth, we are having great fun. Quel programme ...une soirée entre amis bien agreable ..merci pour ce partage ! J'espère que la nuit aura été bonne !Sourires ! Ray: Nous essayons de garder un bon rythme, Claudine, et de varier les choses comme le mode de transport. Il fait très chaud, bien sûr, la réhydratation avec de la bière froide est chose commune. Ray: Life is very, very good, Chris. Ray: Life is good, Bill, and these trips are great fun. This all sounds about to me; my sort of trip. Are you taking the fourth MTB as a spare? These trips are great fun, Alan, and lead us to all manner of adventures and discoveries...when you visit then I might include a few days like this in the itinerary. Perhaps our parliamentary members should have a few drinks before discussing matters Ray, they might come up with ideas as good as your group. Ray: I think cold beer helps to lift the blinkers from the eyes of those who refuse to see, Chad. Oh, I like these colourful boats. The boat restaurants look charming. Yes, you live a life of Riles. Your language of communication might be English, not Thai. Ray: Tim and Koen are fluent in Thai...they have lived here for about 30 years. Tim is English, but has lived and worked in Australia...he and I can converse in a kind of English. Koen is Dutch, but his English is better than my Thai, so we get by reasonably well on a mixture of Simple English, but enhanced with vigorous body language, Philine. This was a really enjoyable trip, I was amused by your reply to Philine, it must be amusing to listen to you all have a long discussion when you put the world to rights. Ray: The main activities on these trips are talking and drinking beer, Brian...the good thing is these work best when multi-tasked. A fine, busy fun day! Ray: A good day, Larry, and it certainly made up for a bit of an underwhelming first day. Ray: Beer is one of those medications that works best when used regularly, Tom.